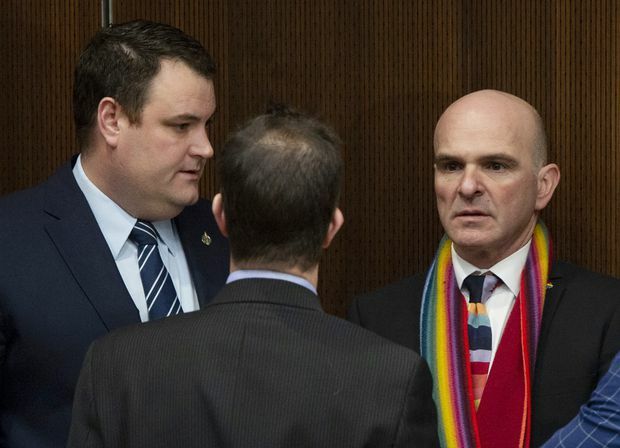 Justice Committee chair Anthony Housefather speaks with Liberal MP Randy Boissonnault, right, and Colin Fraser, left, before a committee meeting in Ottawa, on March 19, 2019. The Liberal-dominated justice committee shut down hearings into the SNC-Lavalin affair on Tuesday, preventing former attorney-general Jody Wilson-Raybould from returning to testify about the fallout from her refusal to shelve the prosecution of the Montreal construction giant. Furious at the Liberals’ action, the Conservatives used procedural tactics to delay Finance Minister Bill Morneau’s budget speech by an hour, and then made it impossible to hear him by chanting “let her speak” and “cover-up,” and banging on their desks before party leader Andrew Scheer led his caucus out of the chamber. The Liberals used their majority on the justice committee on Tuesday morning to adopt a motion to hear no further witnesses, including Ms. Wilson-Raybould. In anticipation that the Conservatives would try to block the budget with points of order and questions of privilege, Mr. Morneau tabled it well before the usual time of 4 p.m., when North American markets close. This allowed the details to be published before he began to speak. Although New Democrat MPs did not take part in the raucous antics in the Commons, they, too, have vowed to keep the parliamentary focus on the issue until Ms. Wilson-Raybould is allowed to testify again. The Globe and Mail reported on Feb. 7 that the Prime Minister’s Office put pressure on Ms. Wilson-Raybould in the fall of 2018 to order federal prosecutors to negotiate a deferred prosecution agreement with SNC-Lavalin Group Inc., the Montreal-based engineering and construction company. SNC-Lavalin faces fraud and bribery charges related to its dealings in Libya. One tactic under consideration is to have the chair of the Commons ethics committee, Conservative MP Bob Zimmer, summon Ms. Wilson-Raybould to testify, although the Liberals might be able to use their majority to block that. Randy Boissonnault, a Liberal member of the justice committee, told reporters there was no need to continue the inquiry, saying Ms. Wilson-Raybould has already testified, as did other key players, including Clerk of the Privy Council Michael Wernick and the Prime Minister’s former principal secretary, Gerald Butts. He said the matter should be left to an investigation by Ethics Commissioner Mario Dion. Deputy Conservative Leader Lisa Raitt said she believes the Liberals closed down the hearings because they were concerned testimony could be used as evidence if the RCMP accedes to a request from Mr. Scheer to launch a criminal investigation into possible obstruction of justice. Mr. Wernick testified that he had “retained personal counsel” because of the Conservative Leader’s formal request for an RCMP investigation. On Friday, The Globe and Mail reported that outside legal counsel have also been retained for Mr. Trudeau and his staff, including chief of staff Katie Telford, Quebec adviser Mathieu Bouchard and senior adviser Elder Marques. Mr. Trudeau’s office said outside lawyers were hired to offer advice on the Ethics Commissioner’s probe. His office declined to say if the lawyers are helping Mr. Trudeau and his staff in relation to Mr. Scheer’s letter. Ms. Wilson-Raybould has testified that she faced “constant and sustained” pressure from the Prime Minister and other senior officials, including “veiled threats,” between September and December, 2018, to override federal prosecutors and order a deferred prosecution for SNC-Lavalin. She was demoted to Veterans Affairs in January, which she said she believes was related to her refusal. The Liberal MP from British Columbia has said she wanted to testify again to explain what occurred between the time she was moved out of the justice portfolio in early January until her resignation from cabinet on Feb. 11. She has asked the Prime Minister to give her another waiver from solicitor-client privilege and cabinet confidentiality. “What happened in that space of time that the Prime Minister is so desperate to hide?” Mr. Scheer asked in Question Period on Tuesday. Mr. Trudeau did not answer, but argued the justice committee heard many witnesses, and the issue should be now be left to the ethics czar. “At least previous prime ministers called for [public] inquiries when they were faced with scandals,” NDP Leader Jagmeet Singh told the House. The political controversy has culminated in the departures of four high-level figures. On Monday, Mr. Wernick announced his retirement, citing the loss of the “trust and respect” of the opposition parties over his role in seeking to help SNC-Lavalin. Last month, Ms. Wilson-Raybould resigned from cabinet and Mr. Butts stepped down. On March 4, Jane Philpott resigned as Treasury Board president, citing a lack of confidence in Mr. Trudeau over the SNC-Lavalin matter. The Prime Minister and Mr. Wernick had conceded they urged Ms. Wilson-Raybould to help SNC-Lavalin, citing concerns about possible job losses, but denied it was inappropriate pressure. Opposition MPs also wanted the justice committee to hear from Mr. Trudeau’s top aides, and Jessica Prince, the former chief of staff to Ms. Wilson-Raybould. Ms. Wilson-Raybould testified last month that Ms. Prince, who took notes, was summoned to a meeting with Mr. Butts and Ms. Telford on Dec. 18, 2018. They wanted an external legal opinion to review the director of prosecutions’ decision to proceed with a criminal trial. Ms. Prince told them this would constitute interference.